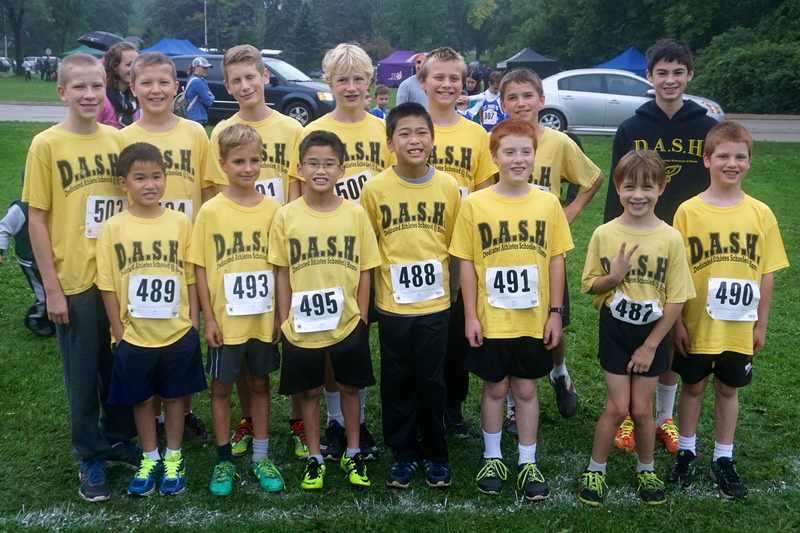 The DASH middle school cross country team was up in Jackson last Wednesday to compete in the very big Kettle Moraine Lutheran High School Grade School meet. It would be our stiffest competition of the season. We would get to see if all the hard work the athletes had put in over the last 8 weeks was enough to get them ready for a meet such as this. The new DASH tent was up. The weather wsa perfect. It was time to race. The open 2500 meter girls race was first. Alexa Bruton, using some inside information from a certain DASH race winner from the day before, showed some star power of her own and was our first runner in. Hannah Schaefer came in soon after, putting together a very well executed race where she stayed fast and steady the whole way. Angela Walters got out fast and coasted in to finish right behind Hannah. Mary LeSac ran pretty well and placed 61st overall. Jenna Walters showed some good effort throughout the race. Talia Kostrzewa was a crowd favorite and left many bigger girls behind her. Natalie Radtke always looked good when I saw her. Next time I am going to watch her more. Josiah Chu got out fast and never looked back as he cruised through the 2500 meter course to a 15th place finish. That was impressive! Micah Chan was back with us and ran pretty well, but was not quite all the way back to where he was before he got sick. Joshua Lipski has never looked better as he pushed himself to a 40th place finish. Noah Caspers capped off another good year on a course he likes, and Elijah Pape showed good effort once again to place 53rd. 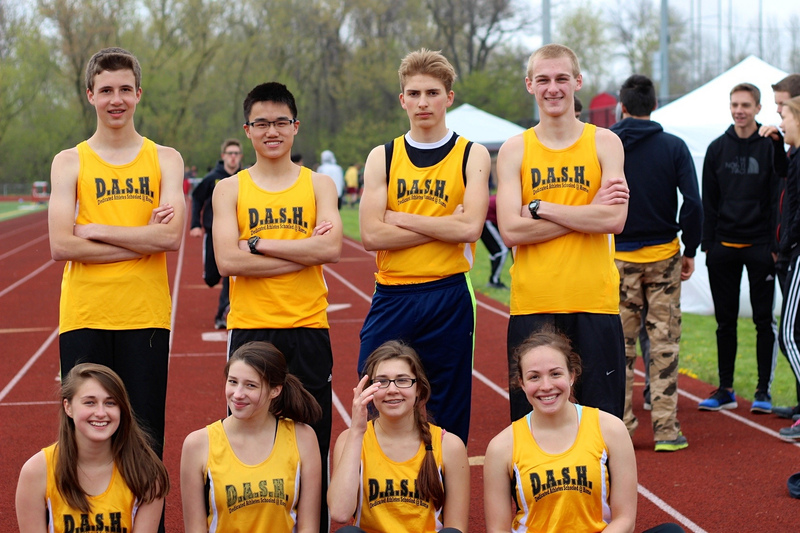 The varsity 3200 meter races were next, and unlike last year, the races had many more athletes competing than in the earlier races. Julianna Caspers got caught in some unavoidable traffic early, but then methodically worked her way up into 12th place by the finish. Julianna brought her ‘A’ game this time. It was impressive. Joy Rasch ran great as usual, and as expected. Joy placed a much needed 46th overall as our second runner in the big field. Bedalia Radtke never let the longer 2 mile course slow her down. I could watch her run all day, and I did catch her finish where she placed 62nd. Savanna Bruton and Grace Caspers paced together for a good portion of the race with Hellena Hacker just a few steps behind. At the end, Savanna’s natural speed helped get her to the finish first in 92nd place. Hellena had a great last loop, eventually moving up into 96th place. Grace Caspers came in soon after in 99th place. I picked the right girls to run varsity. They ran well. The varsity boys finally got to run at about 5:30. Over 200 athletes lined up. The race would be too big for the coach to keep track of team scores throughout. The boys would have to run their best and hope the points landed in our favor. Alexander Taylor and Ethan Blischke got out in front very fast, leaving the heavy traffic behind them. Alexander was our first runner in this time, with Ethan following right behind in 6th place. 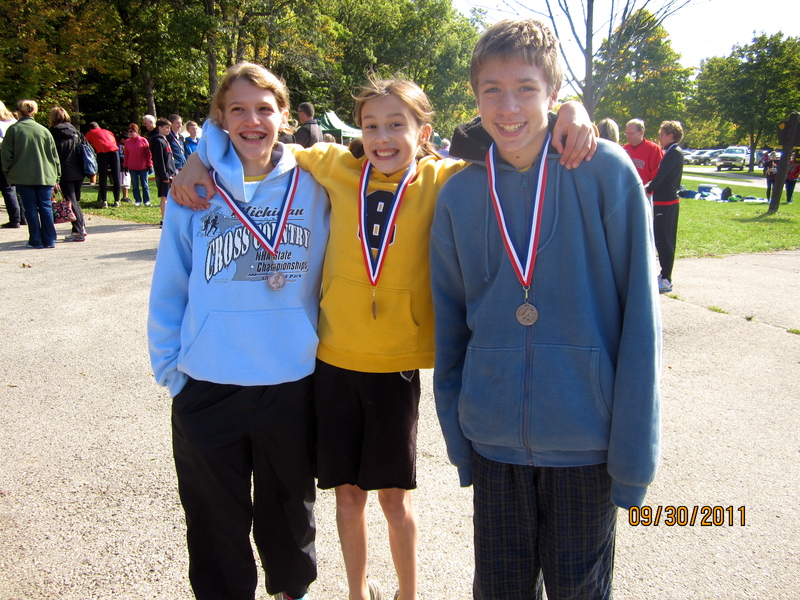 Alex and Ethan had done their job, and earned top-10 medals for their efforts. Their legendary seasons continue. Kaden Hacker got out slow, but did an amazing job working his way through the pack. He has never run better, and gave the team a much needed third athlete in the top-25. With the athletes coming in fast now, it seemed like a long wait until we saw Leif and Nathanael coming down to the finish. Leif would get the 42nd place card, and Nathanael the 48th. No other team looked to have put together a clear winning race, but we I didn’t feel that we necessarily did either. We would have to wait for the award ceremony to see how things turned out. Matthew Schaber finally showed us in a race what he has been showing us in practice. We will need him to do it again next week in Eau Claire. Seka Kostrzewa seemed to struggle in the heavy traffic more than usual. He finished 86th overall, right where the traffic was thickest. Abiah Radtke got a taste of some varsity running. The coach threw him in with this group because of his work ethic and talent. He ran pretty well for his first 2 mile race. While we waited for the results, and before it got any darker, the fun run was started. 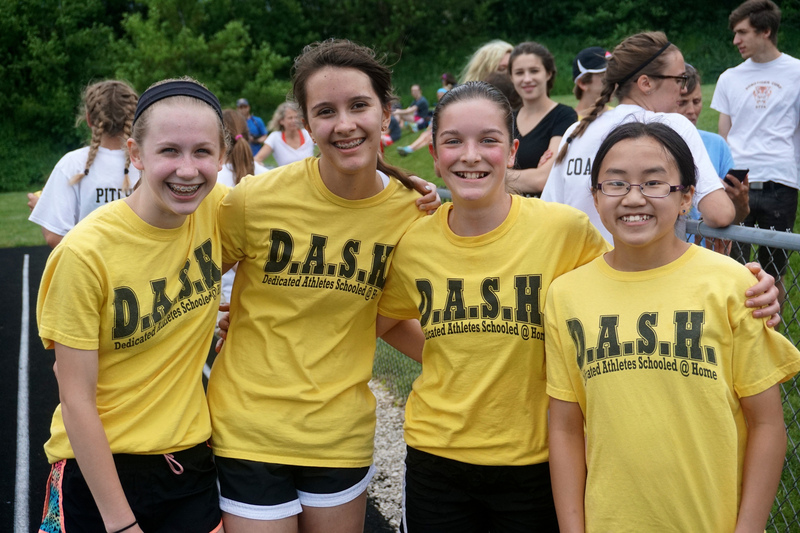 The DASH team always has the largest contingent of fun run athletes and this year was no exception. 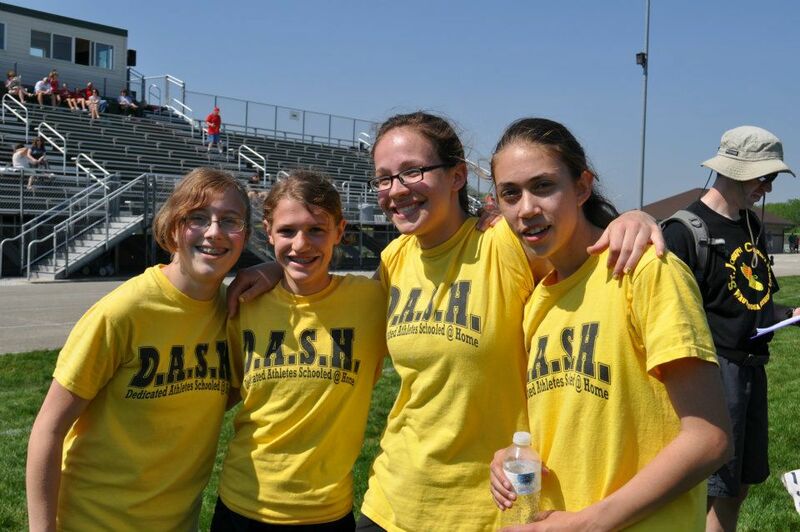 Julianna Caspers took off and led the DASH team through the course finishing the 3200 course in well under 14 minutes. That was faster than her 12th place finish time from earlier, showing how much the heavy traffic can effect times. Leif and Matthew hit the finish next despite having little rest. The coach showed off his running talents, executing a flawless race with practically perfect running form up and down the hills and through the flats. He used Julianna, Leif, and Matthew as his rabbits to finish in 14:03. He won the bald guy division this year in a rout. Mrs. Chan was our top mom, but the coach did catch her walking. 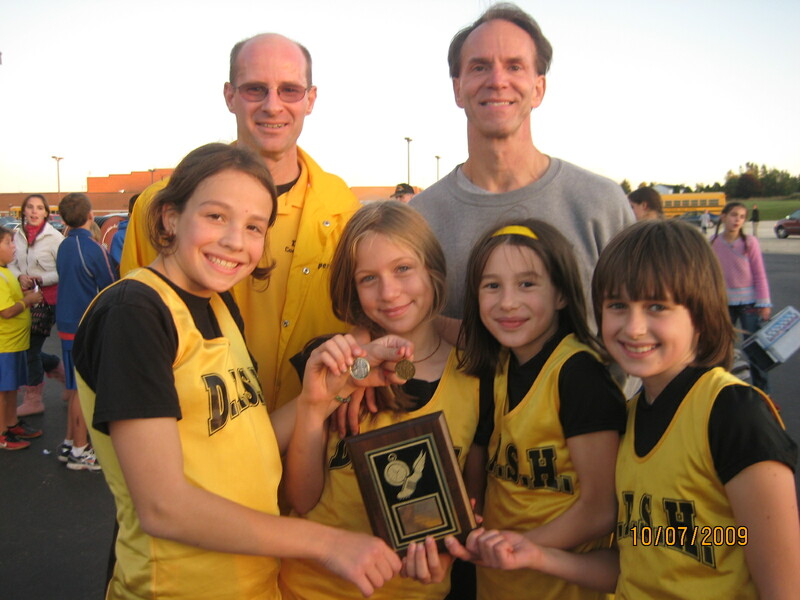 Some future DASH stars such as Philip Caspers and Rhapsody Kostrzesa showed off their talents. All who participated definitely had fun proving once again that it is fun to run. It was finally time for the award ceremony. Ethan Blischke was cheered as he received the 6th place medal. Kaden Hacker went up to receive Alex Taylor’s 5th place medal, and then the rundown started on the boys teams scores. The 3rd place team was revealed and it wasn’t us. 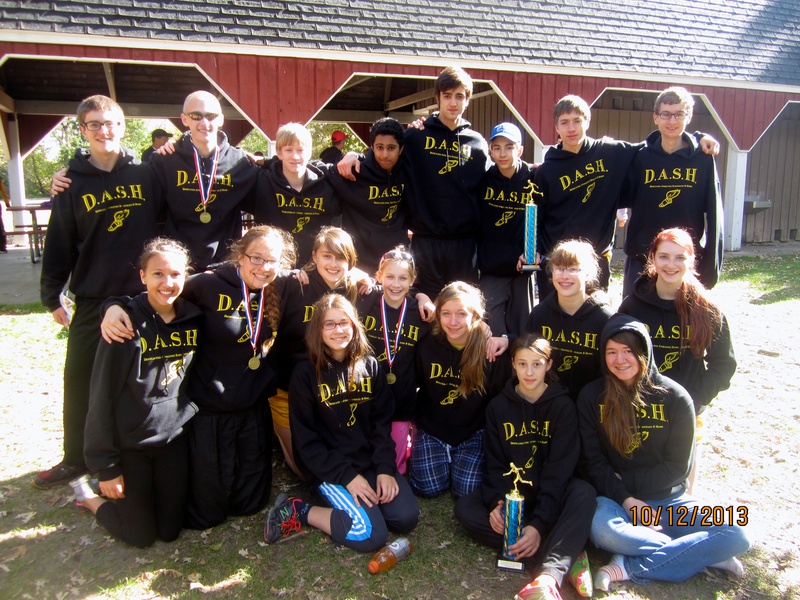 The 2nd place team had earned 109 points, and then the DASH name was called out. It would be 2nd place for us this time. Then we found out the big Badger public school team had won with 105 points. Oh, so close! 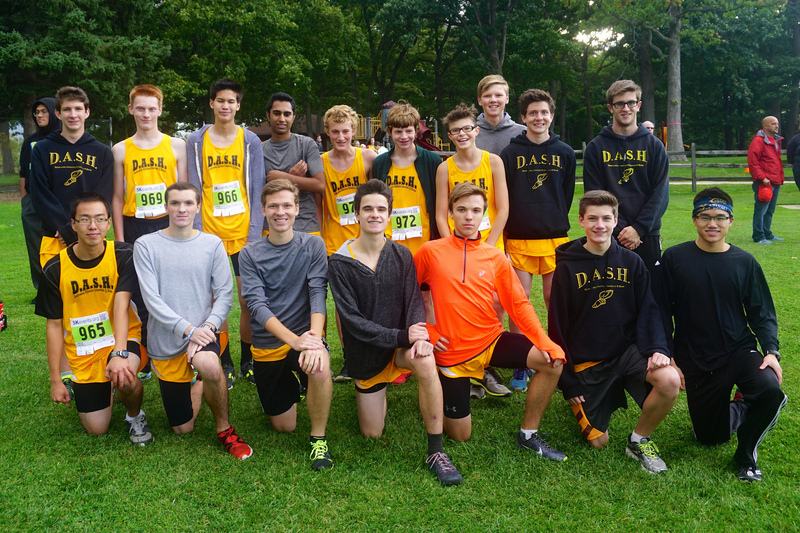 Our top-7 boys did get team medals for their showing making it yet another award winning day for the DASH team. Thanks to Ed Beck for collecting the place cards at the end of the chute. Thanks to those who helped the athletes get their bib numbers pinned on. Thanks to all the parents who made the trek up to Jackson. Thanks to the camera lady who got some pretty good photos while fighting the sun, and then the lack of light. Now we have a week to prepare for some Championship racing next week. I hope to see you there. 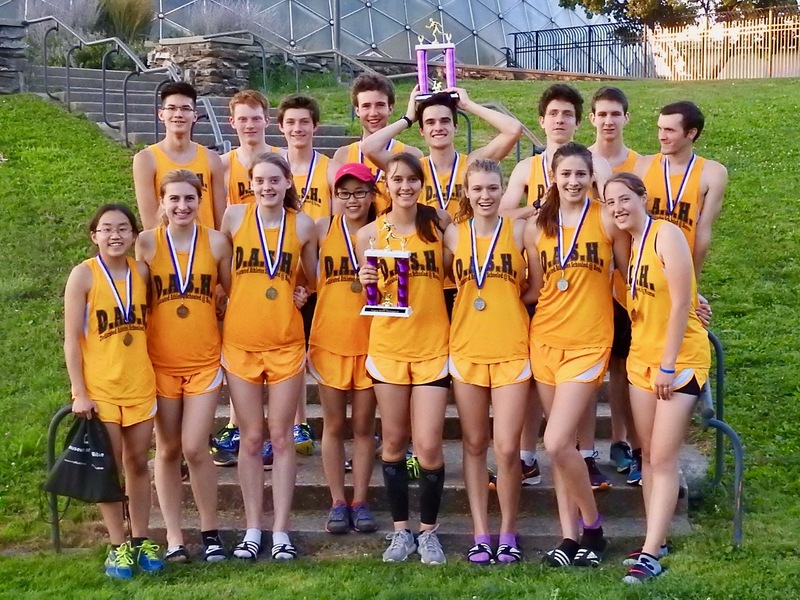 Our award winning high school cross country team was back in action at St John’s NW Military Academy last Tuesday competing in the Lancer Invite. The athletes would have to run the full 5000 meters this year. The boys would be looking for their first team trophy at this meet, while the girls were shooting for their third straight trophy. 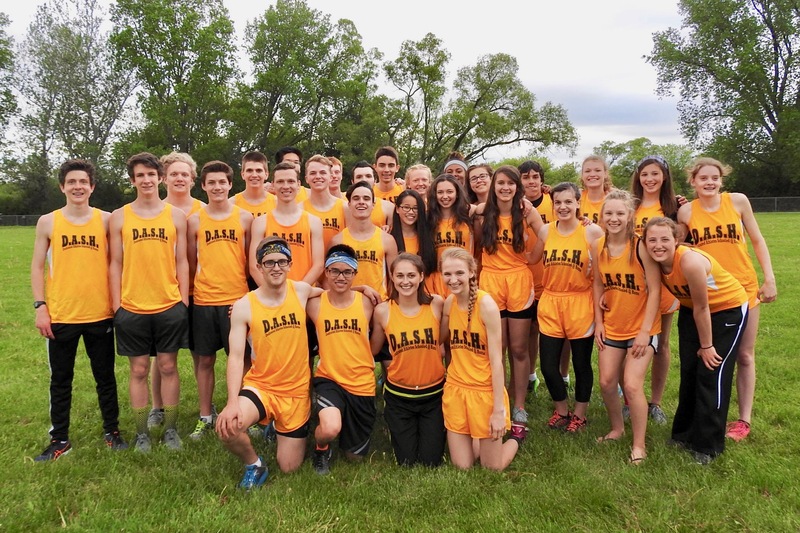 On paper the meet looked to be more competitive this year, but because of injuries and varsity holdouts apparent before the start we found out our chances were better than we thought. Kayla Bruton assumed leadership duties right from the start in the girls varsity race as she had the rest of the field giving chase through the first mile. It became a three girl race heading to the finish, but Kayla proved too strong in the end coming through with a big victory while giving the team a single point in the team scoring. 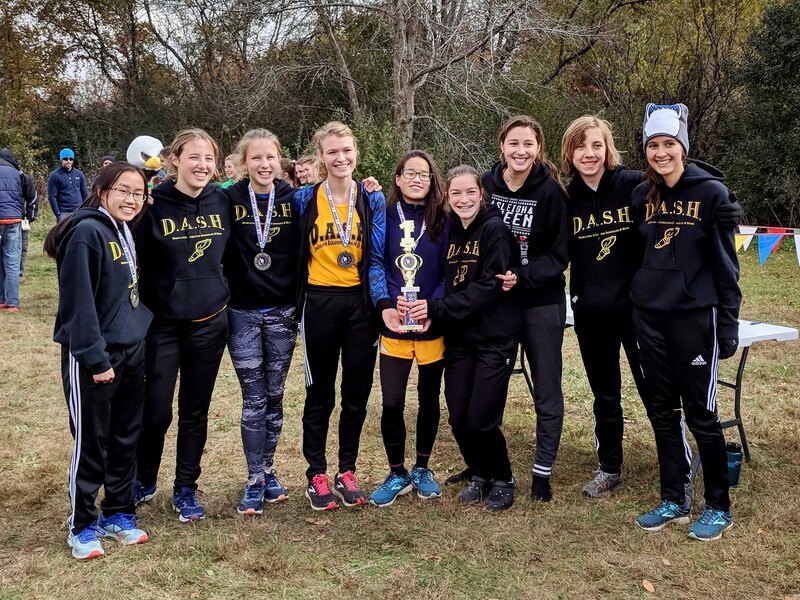 Of the scoring teams, Kenosha St Joseph was finishing strong and had their first two girls come through next, but Abby Chu and Stephanie Chu answered them with their 6th and 7th place finishes ahead of the third St Joseph’s girl. All eyes were on the hill leading to the finishing loop. A St Joseph girl came down first, but Alivia Kempf was not far behind. As they headed for the home stretch, Alivia’s kick was the better giving us a huge two point swing. The DASH fans nervously looked back to the hill and found Faith pacing behind St Joseph’s fifth girl, but more importantly she had also fallen behind the first three Watertown Luther Prep girls. Faith sped up in an attempt to pass, but the Watertown girls’ had all saved plenty for the end. The girls had a good day, but this time it would not be quite good enough, losing out to St Joseph’s by just two points. The 2nd place trophy was ours. 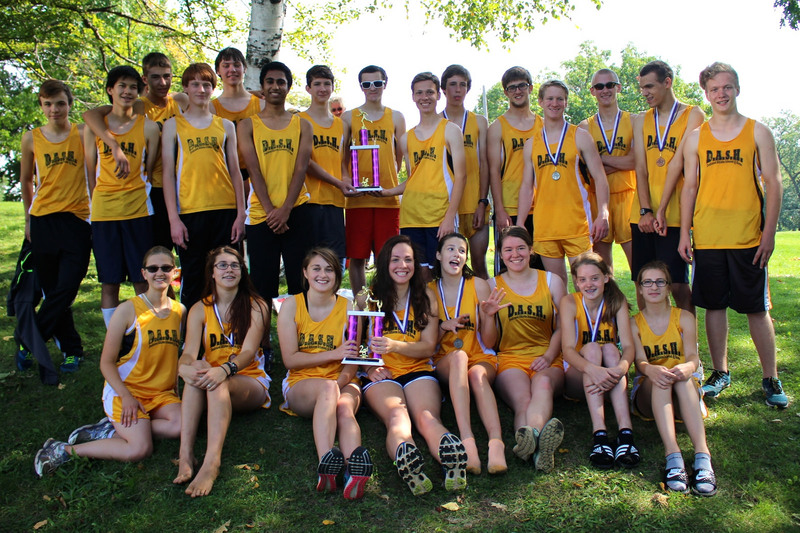 We would have beaten St Joseph’s head to head, but this race was not a dual meet. Jessy Homa struggled through the course before finishing with a nice kick. Later we surprisingly learned her ankle problems were back. Hopefully she will be back healthy and ready to run next week. Katie Gorectke had problems with the heat on the relatively warm October day. She looked dazed at the end, but she had been running well in her last meet. She will get one more chance next week. 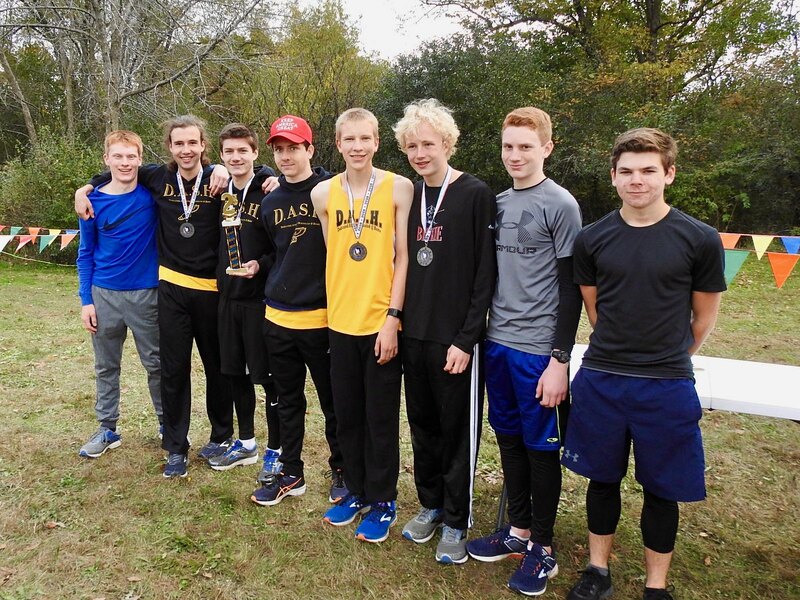 The boys race was much larger with two state ranked teams competing. The third place trophy was up for grabs, but our chances were not helped when our usual number 1 runner, Brian Durbin, was a late scratch because of some leg issues that he did not want to aggravate any more. Caleb Schaber led the boys through the course for the first two miles, but Drake Hacker had a really strong finish to move up into the top 15 while posting a nice 18:46 time. That time was good for the 14th place medal. Caleb finished soon after but in 16th place, missing a medal by a little over 7 seconds. Tim Kowalinski looked strong through the whole course and gave the team much needed third top-20 finish. Vincent Maurer was not at his best this time, but was able to keep Vincent close and place 22nd overall. Without Brian competing, John Klaves cracked our top 5, sprinting in with a 20:56 time with Ben Hughes finishing right behind with a season best 21:01. When the scores were added up the 3rd place trophy was ours! Very nice. 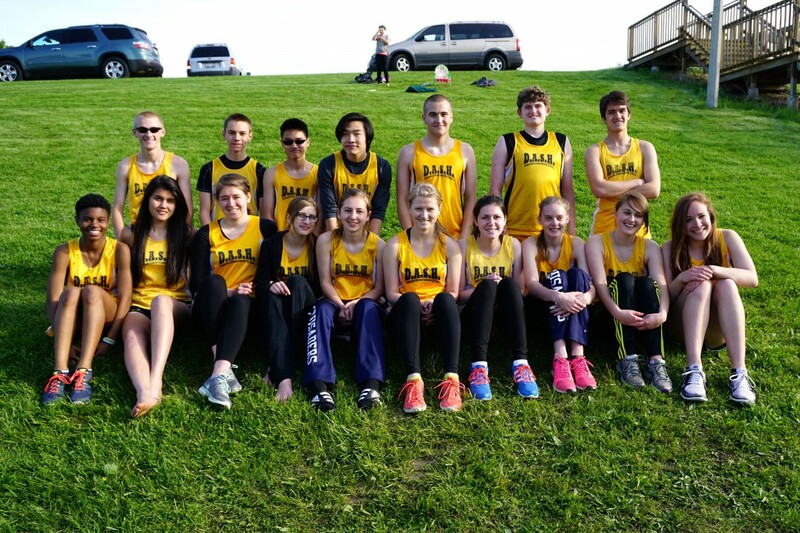 The boys and girls JV teams ran together. Seth Holter ran with the leaders early and looked like the varsity runner he really is, putting his ankle issues behind him and claiming the 4th place medal with a time of 20:44. Joshua Schaber showed that he would be running on varsity for most teams at this meet with his 6th place finish. Theodore Flunker has never looked better and lowered his personal record by over a minute with his 22:59. Let’s hope we see him again. The girls also did very well. Ella Johnson was on a short sabbatical to JV as her 25:38 4th place finished shows. Emma Taylor posted a 26:17 time and had her usual good finish while claiming the 6th place medal. Katrina Lipski thought she was struggling more than she really was. Katrina pushed herself to a season best 28:37 while impressing the DASH fans and the coach with her effort. Naomi Zhou still didn’t start fast enough for the coach’s liking, but she put together a very nice race and lowered her personal record by close to two minutes. Hopefully we will see her back running even faster next year. The Homeschool Championship is all that is left now for our high school team. The girls team is peaking now and will be in the running for a top-2 trophy. The boys team is giving us mixed signals right now. We are down to 10 days to get ready. Hopefully that is enough time to have everybody energized and healthy and ready to run their best race of the season. The boys race should be a close 4-team battle that I am really looking forward to. I hope to see you there. Thanks to Mr. Beck and Mr. Maurer for getting the mile splits and for their help with the coaching. Thanks to Kempf’s for ordering our much-wanted team tent that was on display for the first time. And thanks to the picture people which included the camera lady, Julianna Caspers, and Grace Caspers this time. They did very well with the photos. Now on we go to the big middle school meet this afternoon. Of course, I hope to see you there. 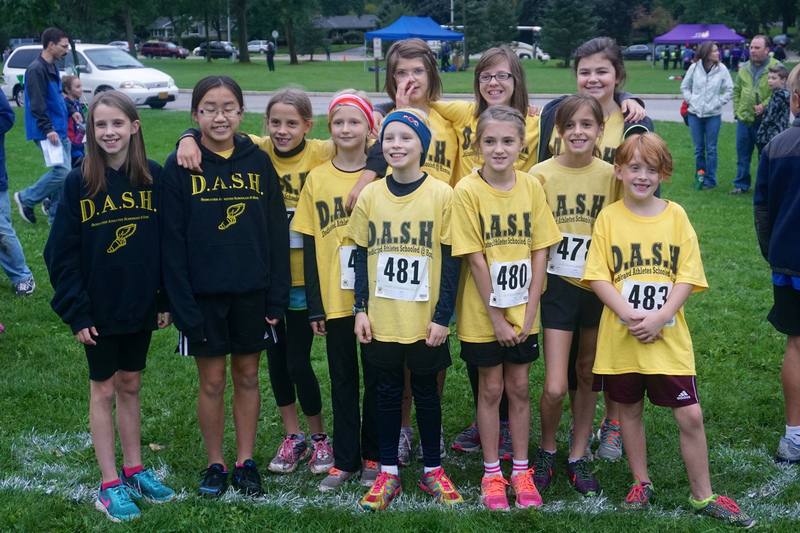 The DASH middle school cross country team was back in action last Saturday morning running on our own Greenfield Park practice course. It was the best weather we have had in many years for the Warrior Invite hosted by Wisconsin Lutheran College, and those staying for the college races afterwards would get an extra treat as four former DASH MVP’s would be competing. 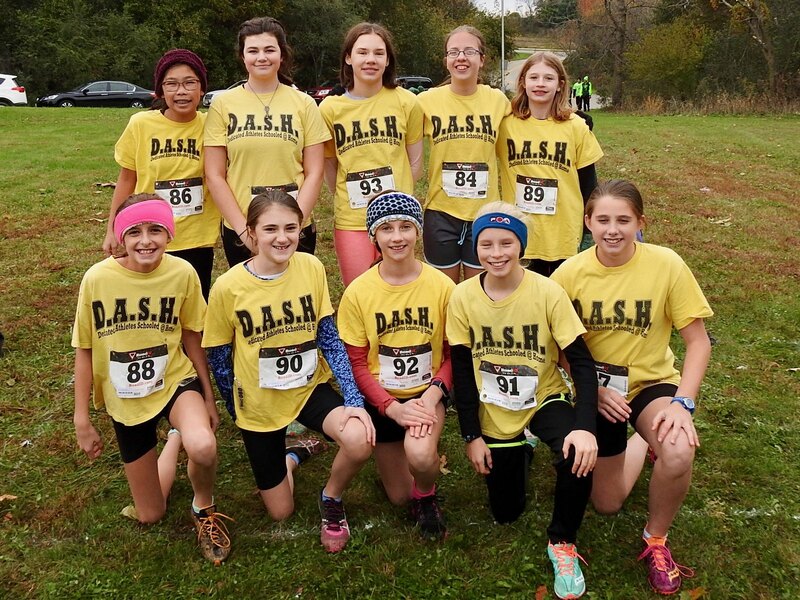 Our middle school team had a very good day at this meet last year running in muddy condition, and this year we would be hoping to cleanly lower our scores just a little more. 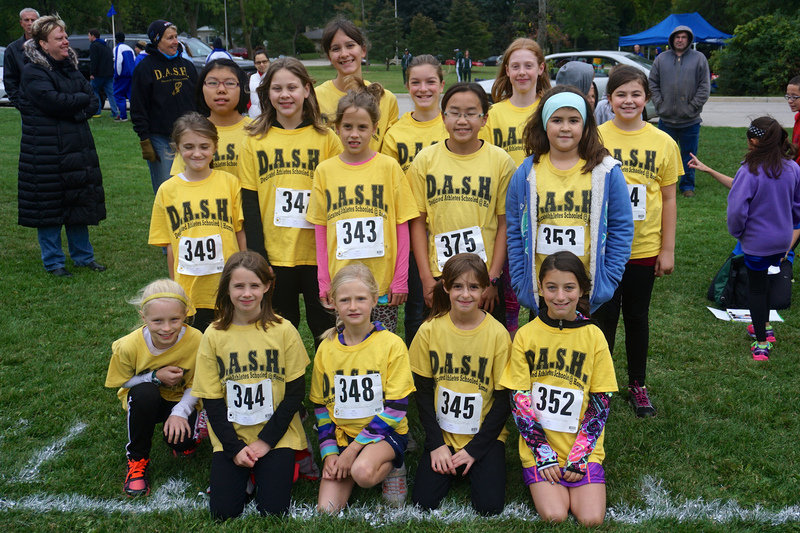 The girls race was first at 9:30 with all the girls running together, but with the 6th and under girls being scored separately from the 7th and 8th graders. Julianna Caspers was our leader through the course, but she was not feeling all that well and didn’t have that extra push to put her in the medals this year, ending up in 17th place. Joy Rasch gave us her usual strong race, keeping Julianna in her sights the whole way and breaking 12 minutes over the 1.6 mile course. Bedalia Radtke showed off her nice stride once again, gliding around the course in 12:21 to place 26th overall. 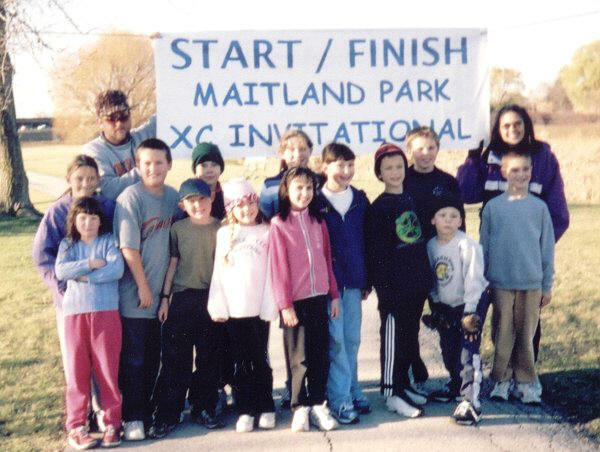 In just her third race, 4th grade Bedalia has already become one of our stars. 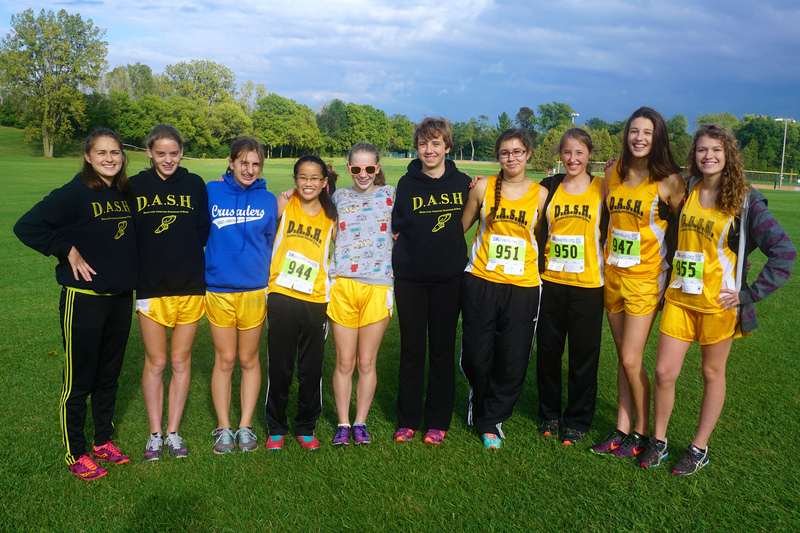 Myra Johnson looked great donning DASH yellow for the first time in a cross country race. She worked her way to a top-30 finish and left the DASH fans wanting to see more. Savanna Bruton gave the team a solid effort once again placing 34th overall as our 3rd scorer. I like the way she is competing out there. Hellena Hacker put together her best DASH race, moving up to be our 4th scorer. Her effort has been superb the last few weeks. Mary LeSac looked much better this time out, pacing just ahead of a struggling Grace Caspers through the course. Alexa Bruton was racing through the course this time and showing the DASH fans how talented she is. Hannah Schaefer and Jenna Walters stayed close the whole way and posted some respectable times as our 3rd and 4th scores in the 7th and 8th grade race. Hannah and Jenna have both been practicing well and improving each meet. Talia Kostrzewa didn’t have her best this time out. Expect our 5-year-old speedster to run much better next meet. Natalie Radtke got off to a good start again, but then found she couldn’t maintain it. The coach will be working with her some more. She is going to be good. Our boys took 2nd place in both divisions last year. It was time to see if we could improve on that just a bit. Alexander Taylor and Ethan Blischke did what they have done all season – get out fast and stay fast. Only one non-scoring athlete was ahead of them as they crossed the line together with identical 9:11 times. Ethan and Alexander had done as good as the DASH fans dared to hope, making it almost impossible for any team to stay with us. Only six other athletes were to go by before the DASH fans eyed Kaden Hacker and Leif Kostrzewa charging to the finish. Leif and Kaden clocked in with identical 9:59 times and had turned the race into a route. There would be no settling for 2nd place this year. The team plaque was ours! The legendary day for the boys did not end there. Nathanael Chu was in the medals once again as he beat all but two of the 6th and under boys. We will be scoring five next week at KML. Anyone scouting our boys should be a little nervous. Seka Kostrzewa was next to hit the finish line, finishing 11th out of the 108 6th and under athletes. Seka placed that high without even having one of his super stellar days. Abiah Radtke had his best day yet finishing with a solid 11:30 time. 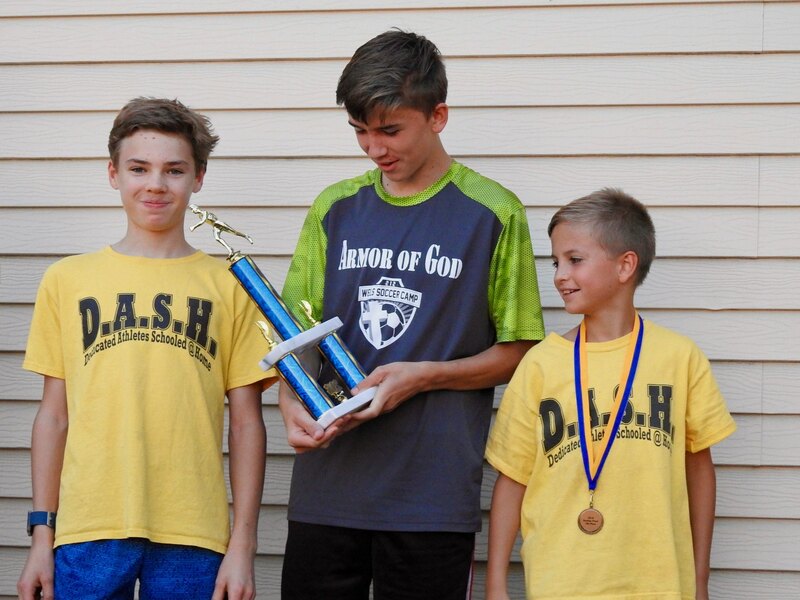 Charlie Johnson took off the second half of the race putting his talents on full display for the DASH fans, and giving the 6th and under team a good 3rd runner. Silas Johnson and Josiah Chu came in together, getting matching 12:03 times. 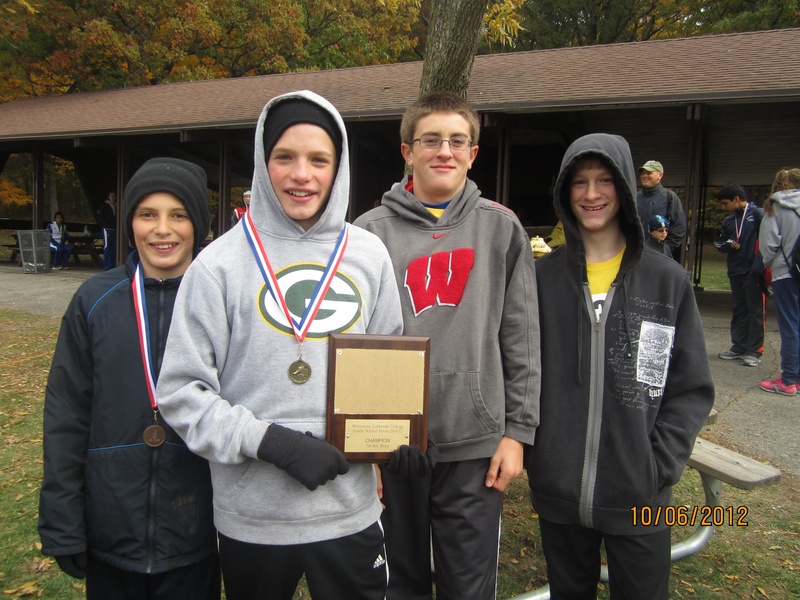 The little boys were also very good, placing 3rd overall in the 25 team race. Joshua Lipski had his best race of the season. Joshua stayed just ahead of Elijah Pape who was racing for the first time. Elijah really pushed himself and impressed the coach. Noah Caspers had a very good finish to come in alongside Elijah. Our boys team really had a big day. Well done! The DASH fans stayed to cheer on our three individual medal winners, and the DASH cheering only increased when the boys were called out as the winning team with a very low 22 point score. Then the college racing started, giving those who did not want the special day to end so early a chance to continue on. Andrea Beck ran in her first college race and finished the 6k race in 27:53. Not too bad, but she is capable of much more. Junior Siobhan Heiss was the 5th scorer on the 4th place Wisconsin Lutheran team. Justin Chu just missed breaking 30 minutes in just his second 8k race. Justin did not run much over the summer, but he is starting to look pretty good right now, but his Trinity International team needs to keep a fifth runner healthy. Jacob Dickman’s St. Norbert’s team won the overall trophy. Jacob was a key to their victory, finishing as their top men’s runner with a time of 27:32. Jacob has never looked better, or run faster. 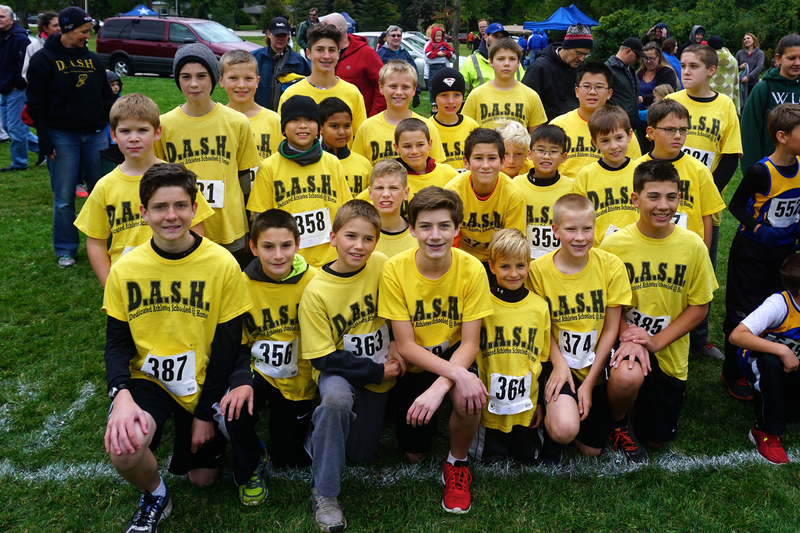 It was a day we got to see plenty of DASH legends, some from the past and some new ones from the present. It was another great day in DASH history. Thanks to Mr. Beck for his usual coaching assistance. It was great to see great DASH fan Pete Dickman on hand. He showed in time to help out with the middle schoolers, and then stayed to cheer on his son’s team in the college race. Thanks to Mrs. Chu who prepared a fantastic meal for the Trinity team and for the DASH fans who stayed for the college race. Thanks to all who helped the athletes get their bib numbers pinned on. Thanks to Steve Travis and his staff at Wisconsin Lutheran College for hosting and giving us the chance to race. Thanks to the camera lady and Zipporah Caspers for getting the photos. Unfortunately Ethan and Alex proved too fast for them and for the camera. We will be better prepared for their speed next time. 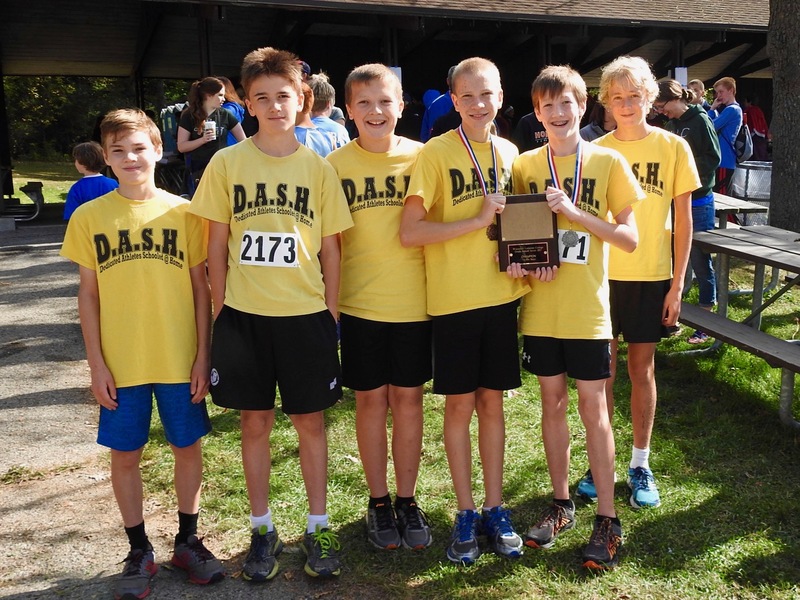 The middle schoolers will be back racing this Wednesday in an equally big meet. You know you want to be there. And, of course, I hope to see you there.